The new Cafflano Klassic by Beanscorp is an all-in-one pourover system. It's a simple and compact piece of brewing equipment that works very well. Hansang Yoon, the CEO of Beanscorp and the inventor of Cafflano Klassic, was just an ordinary businessman who loved coffee. Although he was a coffee lover, he didn't want to spend too much on an espresso machine or capsule coffee machine (which can be expensive and not handy). Purchasing and handling all of the different components of a brewing kit was also a hassle for him. So he began to imagine a simple and affordable, portable coffee maker. That was the start of Cafflano Klassic. The lid of the brewer has a diamond shaped hole that allows it to pour equivalent to your directional kettle. It holds a max of 270mL of water. The ceramic conical burr grinder has an extendable arm to rotate for grinding. The grinder has a click stop adjustment, so you can select the coarseness of your grind. The permanent stainless steel filter is well made and filters the brew well. The double-walled stainless steel tumbler has a capacity of 250mL from the bottom of the filter (450mL once the filter is removed). It's also BPA free. 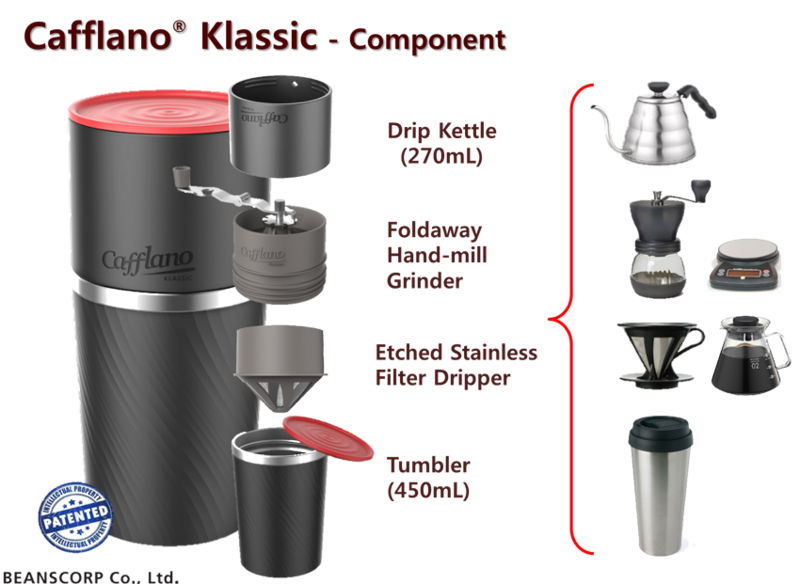 As I took my Cafflano Klassic out of the box, I was pleasantly surprised by its beautiful feel and sturdiness. It reminded me of my thermos, but inside the tumbler were all the components to make a good pour over. The lid of the brewer has a carefully designed diamond-shaped hole allowing it to act as a directional kettle. It takes a little bit of time to get used to it, but overall it works extremely well. Under the lid you will find a ceramic conical burr hand grinder. It has an extendable arm to rotate for easy grinding and a click stop adjustment, so you can select the coarseness of your grind. The ground coffee falls straight into the permanent stainless steel filter. The filter is well made and filters the brew well, but it requires a fairly course grind to allow the water to pass through for a reasonable brew time. The result is decent, but some fines do get through the metal filter making the brew a little cloudy. I added a paper filter before the metal filter which produced much more clarity in the brew. The double-walled stainless steel tumbler functions as a travel mug (and it's BPA free, which is a plus). Overall it’s a clever concept and design, and a neat alternative to an Aeropress and hand grinder for use when travelling. Using a paper filter in the cone makes the brew a lot cleaner and brighter, resembling a V60 system. A scale is essential for a perfect brew, but the grinder has line markers that help you determine bean weight. I guess if you use it enough you will recognise the line marker that you need to hit. For more information about the Cafflano Klassic by Beanscorp visit the website. Grind 17g on a medium course grind. Fill the Lid to 270mL (just below the diamond shaped hole). Start pouring the water in a circular motion. At 34ml stop and let your coffee bloom for 30 seconds. Pour the remainder of the water into the filter. You should have a brew time of about 3.30 minutes.